Here at Rohr Jewelers, pearls are definitely our specialty. We have one of the largest collections of cultured and natural pearls in the Midwest. Shop owner Sam Hill has a deep passion for pearls and travels to Japan annually to bring back a gorgeous array of pearls of all types. He also designs many pearl pieces featured in our store. The pearl, a symbol of purity, virtue and modesty, is one of the most precious gems in jewelry. Technically known as "organic gems" because they are formed by mollusks, pearls have been harvested and worn for more than 4,000 years. The way they are harvested and cultured has changed over time, but pearls and pearl jewelry continue to be a classic. A pearl is formed when an irritant, such as a parasite, becomes lodged in the shell of a mollusk. The mollusk deposits layers of a semi-translucent crystalline material called "nacre" around the intruder. where it builds up in layers like the rings of a tree. This process of building up can continue for years, resulting in a pearl. In nature, pearls take many years to develop and often have irregular shapes, ranging from slightly off-spherical to twisting, bulging shapes called "baroque." In any shape, natural pearls are rare and very costly. Around the beginning of the 20th century, Kokichi Mikimoto discovered that if a sphere of material was placed into an oyster, and the oyster stimulated correctly, the oyster would coat the sphere with nacre, creating an almost perfectly round pearl. The longer the pearl remains in the oyster, the larger and more valuable the pearl becomes. These are called "cultured" pearls. Almost all pearls used in jewelry today are cultured pearls. Pearls are cultured all around the world by different types of oysters and mollusks. The type of oyster or mollusk, where they are raised, and environmental conditions, help determine the different sizes, colors, and characteristics of a cultured pearl. Luster: Luster is caused by light hitting and penetrating the pearls nacre. The light is reflected from different levels and angles created by the overlapping layers of nacre. This gives a pearl its brilliance and inner glow. Complexion: Pearl nacre is a matrix of calcium carbonate crystals. This matrix can be laid down in a perfectly uniform pattern over the entire pearl. Shape: Pearls starting with a round bead nucleus can still form many different shapes. These include Round, Semi-Round, Drop, Button, and Semi-Baroque. Color: Pearls come in a wide variety of colors naturally. The most popular are white, black, golden, pink, and different shades of these. Certain pearls also have secondary color or overtones. 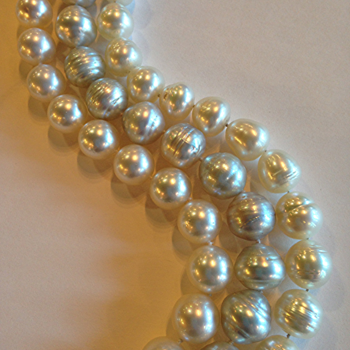 Size: Pearls come in all sizes, from under 1mm to over 20mm. Larger sizes of any variety of pearl will be the most valued. Chinese Freshwater pearls differ from most pearls cultivated because they typically insert a piece of mantle tissue as a nucleus instead of a shell bead nucleus. Chinese Freshwater pearls are constantly evolving in size, color, and lustre. The Chinese produce approximately 150 tons of freshwater pearls annually. With this large of a production the quality and cost of these pearls runs the gambit, from extremely fine to a few dollars a strand. Through many trials and hardships Kokichi Mikimoto was able to obtain the first of his cultured pearls in 1893. These were half pearls attached to the oyster shell. Mikimoto went on to produce perfectly round cultured pearls. This set the stage for the entire pearl culturing business. Akoya Pearls are traditionally the classic white strand of pearls that come to mind for most people when they think of pearls. They typically have the nicest lustre, surface and complexion of pearls. Akoya pearls are most commonly cream in color, although they can also have a rose, silver, blue, or golden yellow hue. Akoya pearls are also cultivated in China and Vietnam. The pearls of Tahiti are commonly known around the world as Black Pearls and are cultivated mainly around the islands of Tahiti and French Polynesia. These exotic pearls have a dark body color, and come from the Pinctada Margaritifera, or black lipped oyster. They are considered the second most rare and valuable pearls in the world, right after South Sea pearls. Tahitian pearls come in a large variety of natural dark colors, from black to silver, greens to greys to browns. The most commercially desirable are black with a strong peacock overtone of green or rose. Tahitian pearls can range anywhere from 8 to 18 millimeters in size. South Sea Pearls are among the largest, rarest, and most valuable of the cultivated pearls. They range in size from 9mm to 22mm. They come in two varieties, the White South Sea and the Golden South Sea, both of which are cultivated by the Pinctada Maxima oyster. The Pinctada Maxima is the largest type of saltwater oyster in the world and can grow as large as a dinner plate in size. South Sea Pearls have a unique satiny lustre, that comes from the fast growing nacre of the warm South Seas. White South Sea Pearls can be stark white in color or silver with varying ranges of tones. The Pinctada Maxima, or white lipped oyster is primarily grown in Western Australia. The silvery white rim of this oyster is where the White South Sea pearls get their beautiful color from. Golden South Sea Pearls are similar to the white South Sea pearls in their size, lustre, and growing range. The main difference is their color. Golden South Sea pearls range from a soft creamy yellow to a very intense deep golden color. The golden-lipped oyster is mainly grown in the waters of Australia, Indonesia, and the Philippines. It is from the rim of this oyster that the pearls attain their beautiful golden color. Kasumigaura pearls are natural colored, bead nucleated pearls. Kasumigaura pearls come in off-white, peach, orange, pink, lavender to violet hues, and rare golden green hues. They come in sizes from 8mm to 18mm. Pearl farming has been taking place at Lake Kasumigaura since 1962 and is closely linked to Kasuhisa Yanase. He is one of three pearl farmers at Kasumigaura and is still cultivating pearls today. Keshi is a term derived from the Japanese word for "poppy seed." During the culturing process a shell bead is inserted into the oyster or mussel. Sometimes a foreign matter or piece of tissue used to create the pearl sac can get lodged in the mollusk. This can form a Keshi pearl. Keshi are often very high in lustre because they are usually mainly nacre. 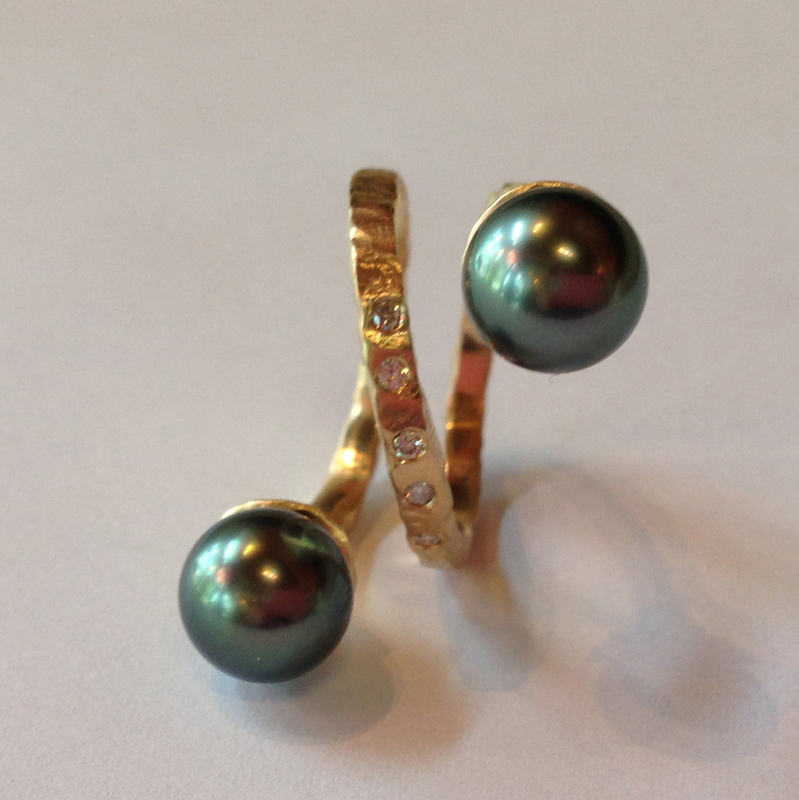 Keshi can form in all of the different mollusks that form cultured pearls.